Before Famous appeared on my show I chatted with him about the interview process associated with Hiphop. Famous gave some insightful answers, and as always his personality was larger than life. We talked about his history and some of the things he is doing right now. He was excited to be heading to Texas the following morning to perform at this year’s SXSW festival. Here is an excerpt from the story with some multimedia elements. The music industry is a fast paced world where what’s hot today is old news tomorrow and fans are well versed on their favourite artists. This makes the task of interviewing musicians especially hard for journalists who want to have meaningful interviews that resonate with their audience while informing them at the same time. 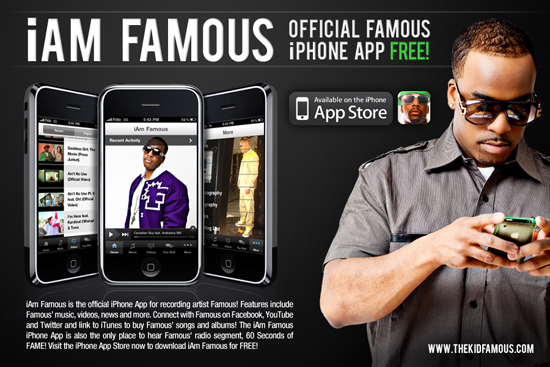 Famous also harnessed the power of the emerging social technologies and launched his own ‘I am Famous’ app for iPhones that allows fans to keep up with the rappers latest musical releases, upcoming shows and everything else you can think of. Needless to say Famous’ drive and charisma will continue to carry him right down the road to centre stage. This entry was posted in Hip Hop, Media, Toronto and tagged Social Media, SXSW, The Kid Famous, Toronto. Bookmark the permalink.